Midblock crosswalks facilitate crossings to places that people want to go but that are not well served by the existing traffic network. 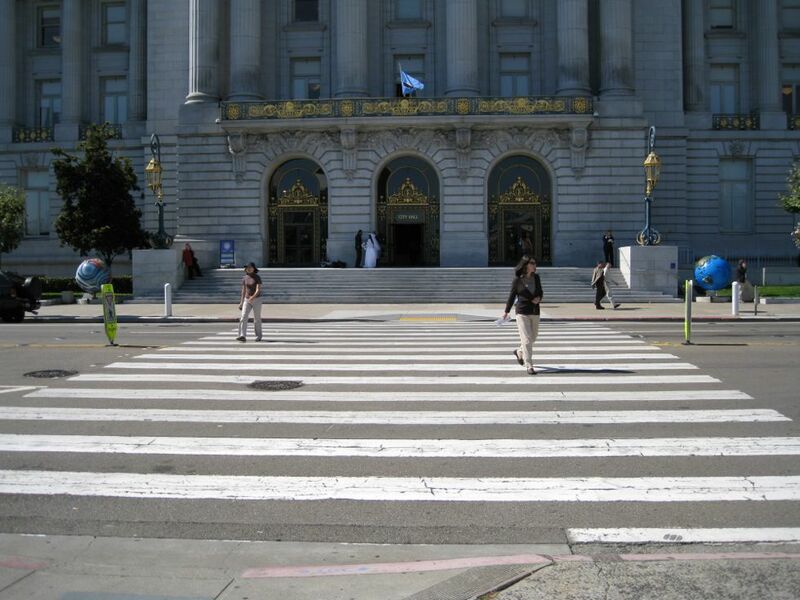 These pedestrian cross­ings, which commonly occur at schools, parks, museums, water­fronts, and other destinations, have historically been overlooked or difficult to access, creating unsafe or unpredictable situations for both pedestrians and vehicles. 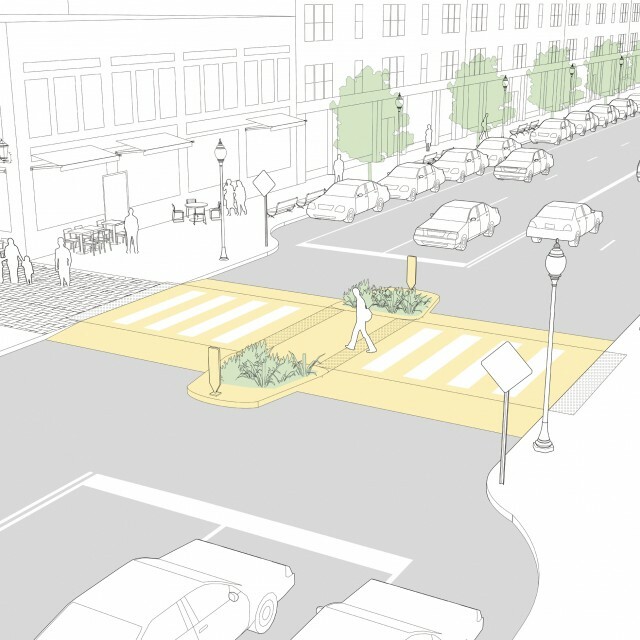 Designers should study both existing and projected pedestrian volumes in assessing warrants for midblock crossings to account for latent demand. Where an unsignalized crossing exists at a transit stop, enhanced crossing treatments or actuated signals should be added. 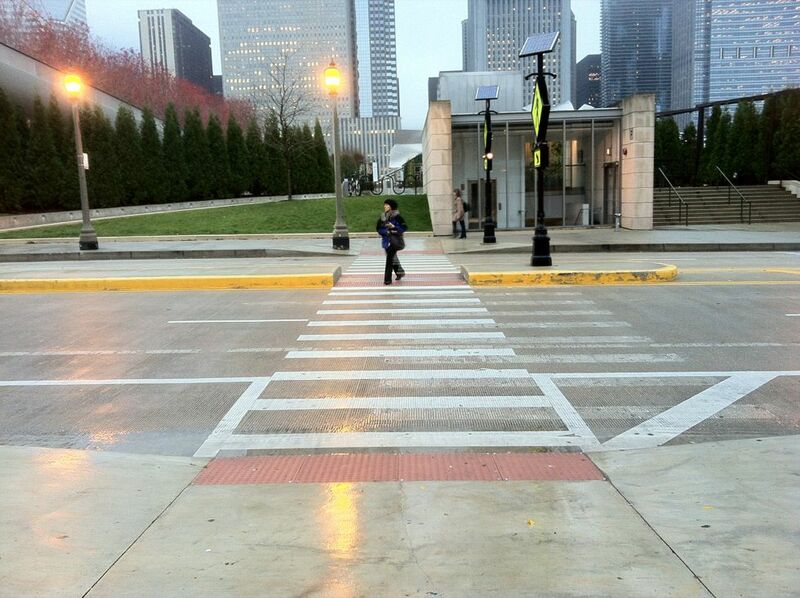 1 Install a midblock crosswalk where there is a significant pedestrian desire line. 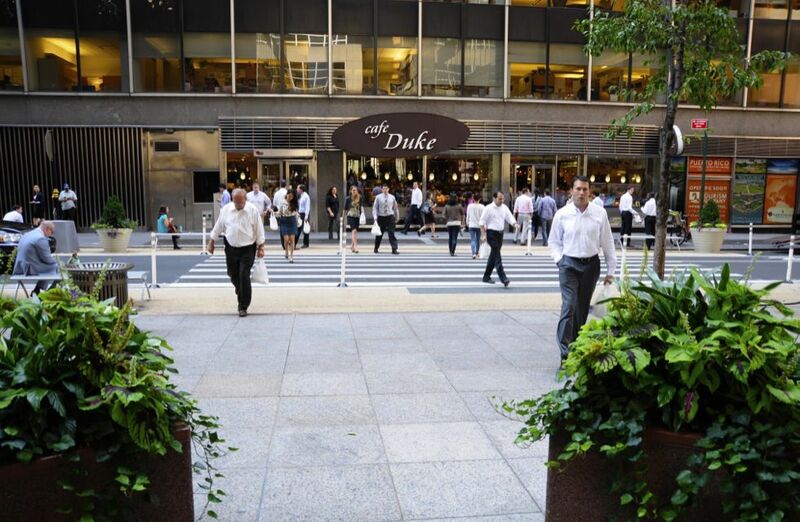 Frequent applications include midblock bus stops, metro stations, parks, plazas, building entrances, and midblock passageways. 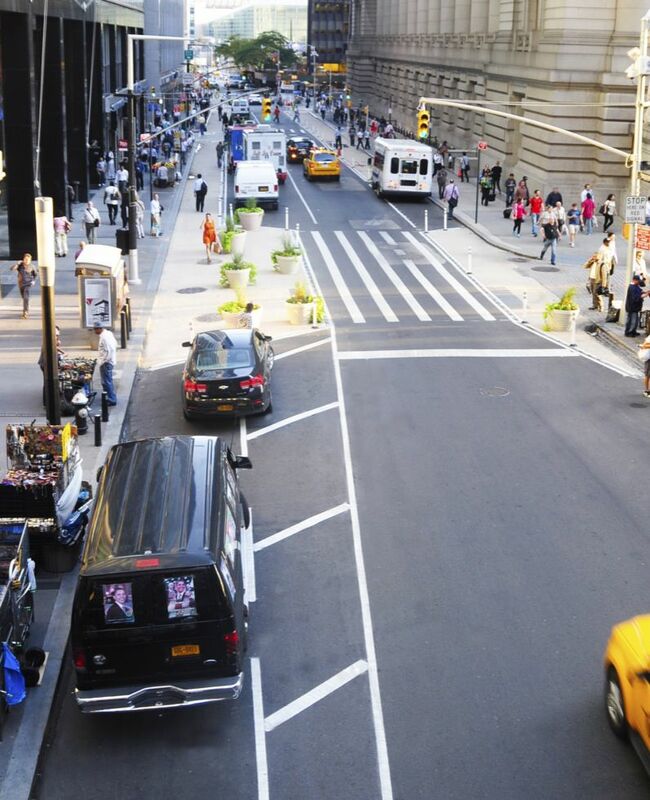 Vertical elements such as trees, land­ scaping, and overhead signage help to identify crosswalks and islands to drivers. 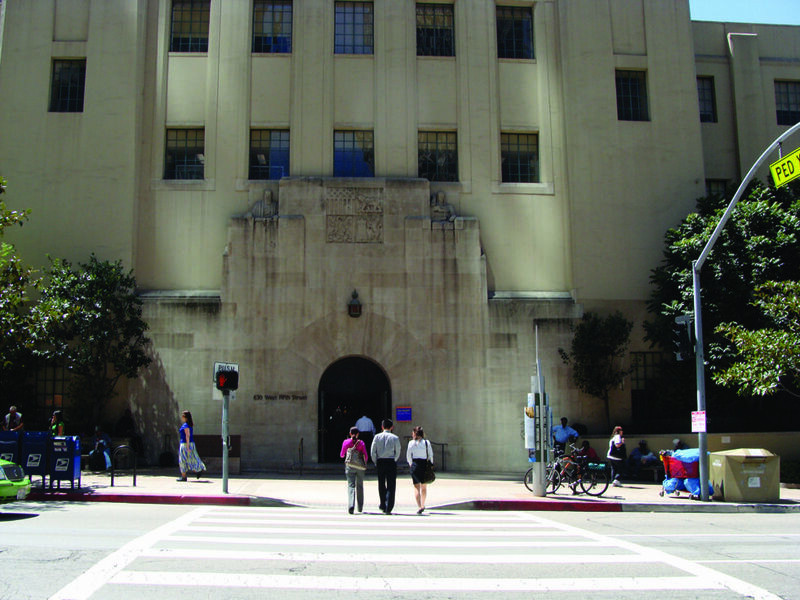 2 Daylighting in advance of a cross­ walk makes pedestrians more visible to motorists and cars more visible to pedestrians. This may be accomplished by restricting parking and/or installing a curb extension. 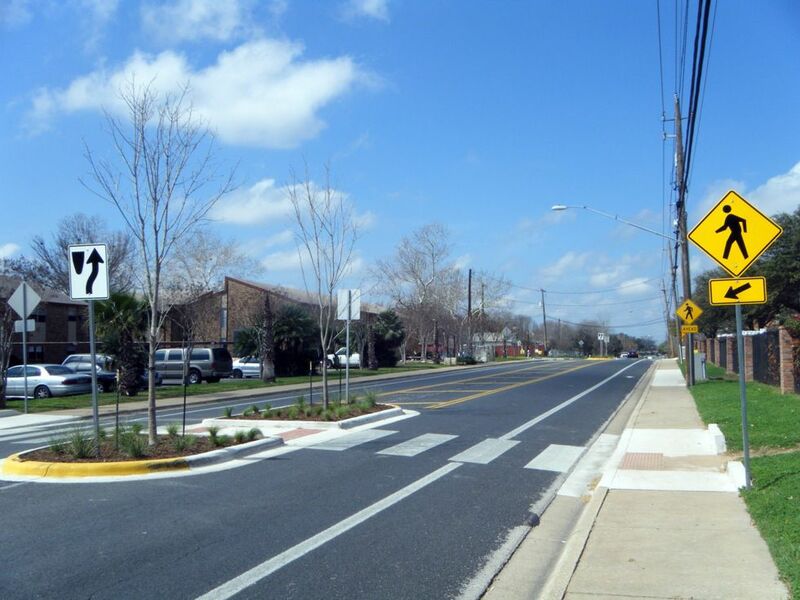 3 Stop lines at midblock crossings should be set back 20–50 feet. This ensures that a person crossing the street is visible to the second driver when the first driver is stopped at the stop line. 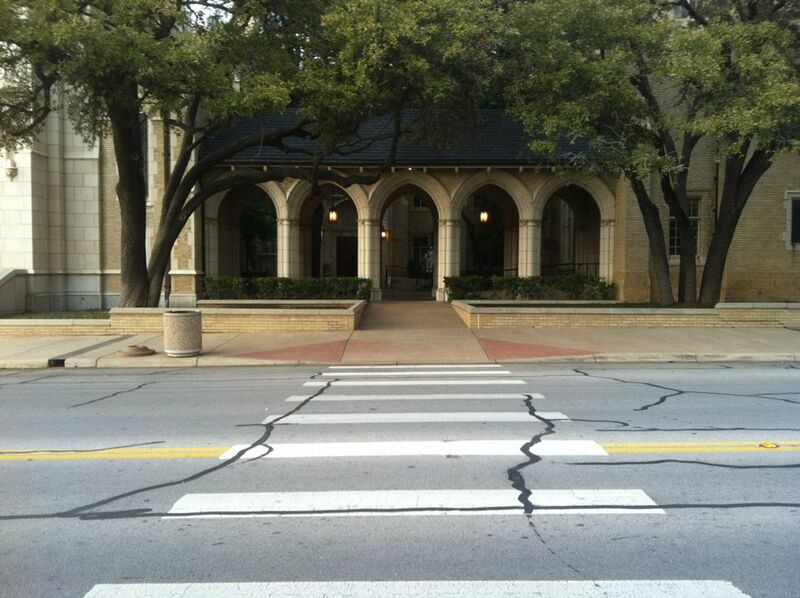 4 Stripe the crosswalk, regardless of the paving pattern or material. Otherwise, drivers are not likely to see it, especially at night. 5 Medians or safety islands create a 2­stage crossing for pedes­trians, which is easier and safer. 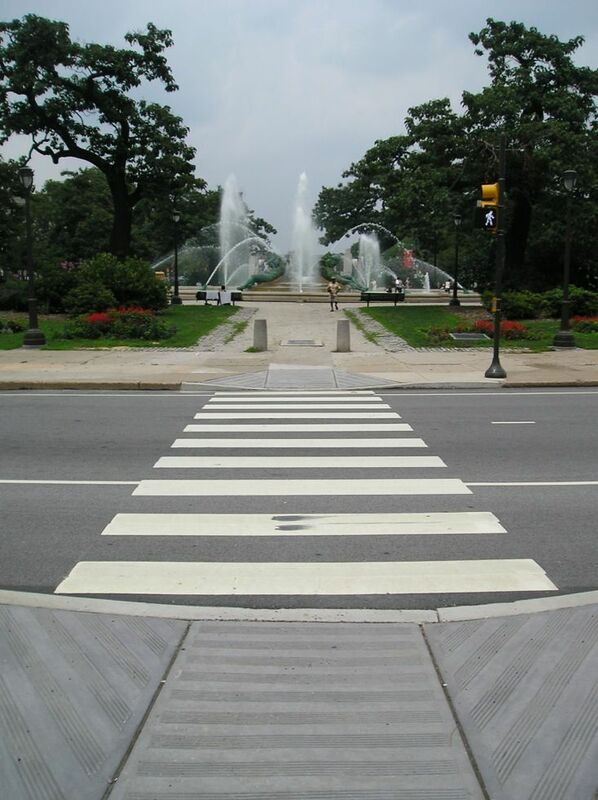 6 At key access points to parks, schools, and waterfronts, and at intersections with local streets, raised crossings increase visibility, yielding behavior, and create a safer pedestrian crossing environment. Where an unsignalized crossing exists at a transit stop, enhanced crossing treatments or actuated signals should be added. Transit stops should ideally be located so that pedestrians cross behind the bus or transit vehicle. 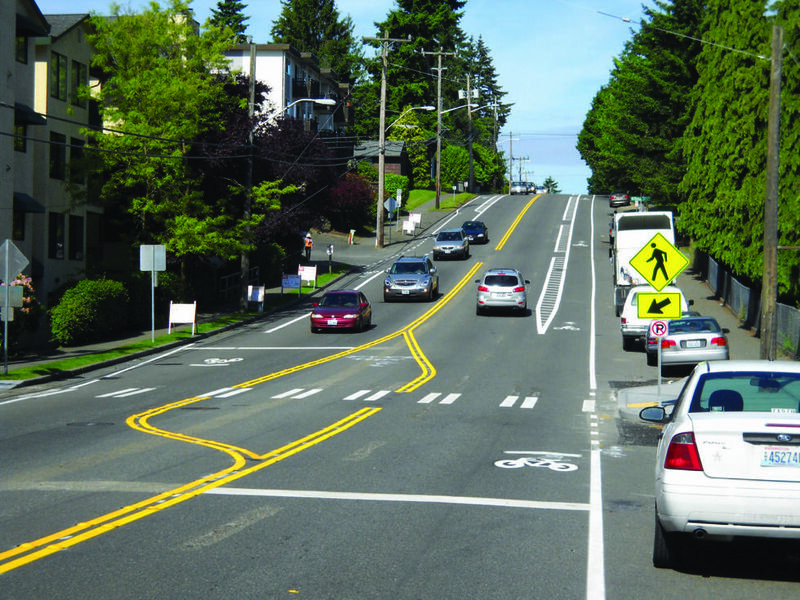 Far­ side stop placement is preferable to near side or midblock placement and increases the visibility of pedestrians crossing behind the bus. 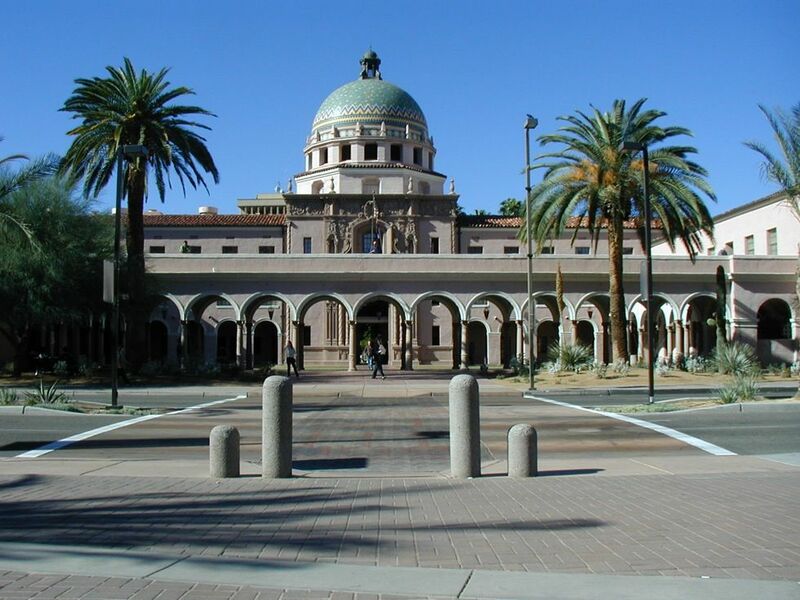 A pedestrian tracking survey may be used to document where and how people cross a street, complex intersection, or plaza. 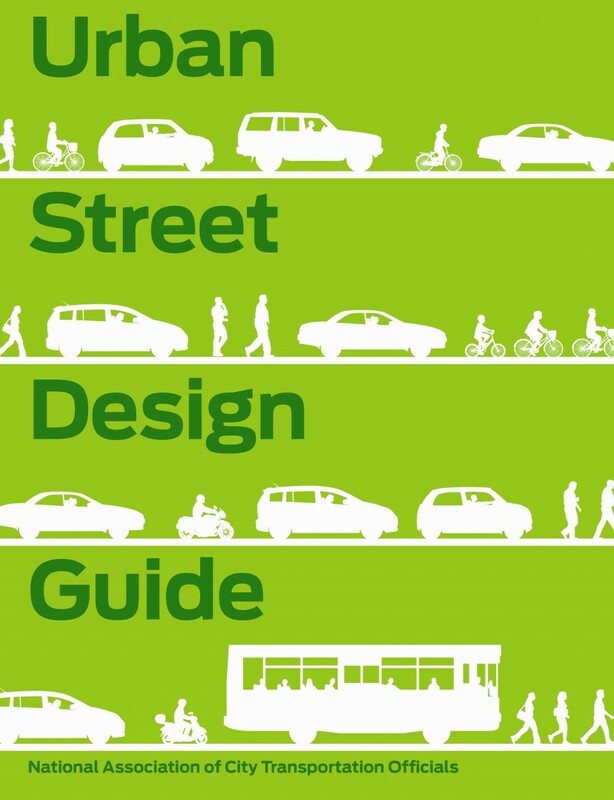 This information is useful in locating crosswalks and safety islands, redesigning intersec­tions, and understanding the interface between streets and the surrounding buildings and public spaces. Actuated pedestrian signals (half­ signals), hybrid beacons, or rapid flash beacons may be considered at greenway crossings, midblock locations, or unsignalized crossings where infrequent crossings make a traffic signal or stop sign unnecessary. Fixed­-time signals or passive detec­tion are preferable to push­button detection. 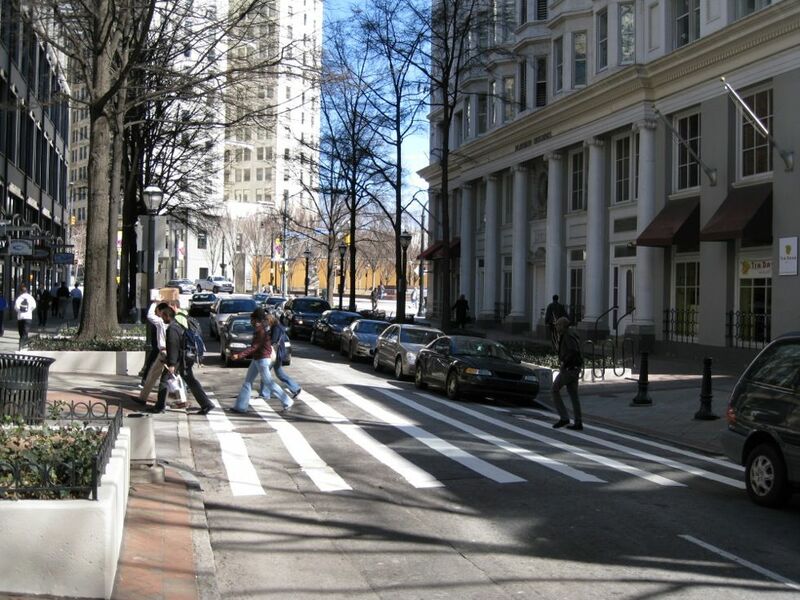 Unsignalized midblock crosswalks may be applied at locations with inconsistent pedestrian demand or where a pedestrian connector intersects midblock with a small­ or medium­sized roadway. 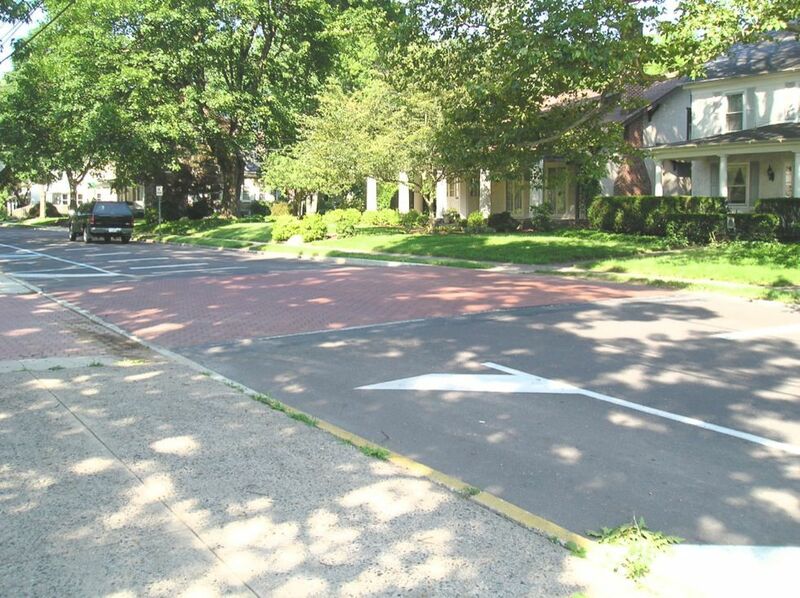 Unsignalized crossings should be highlighted using additional warning signage, high­visibility lighting and markings, actuated beacons (where applicable), and traffic calming features, such as raised crossings and mid-block curb extensions. 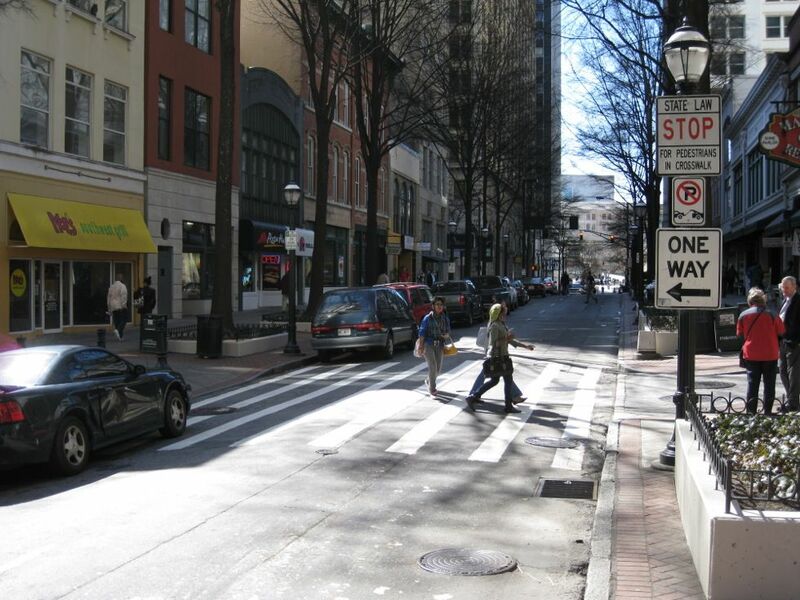 Where midblock pedestrian cross­ings in a low­-volume downtown commercial or neighborhood residential area are frequent, a designer may consider the application of a shared street treatment. 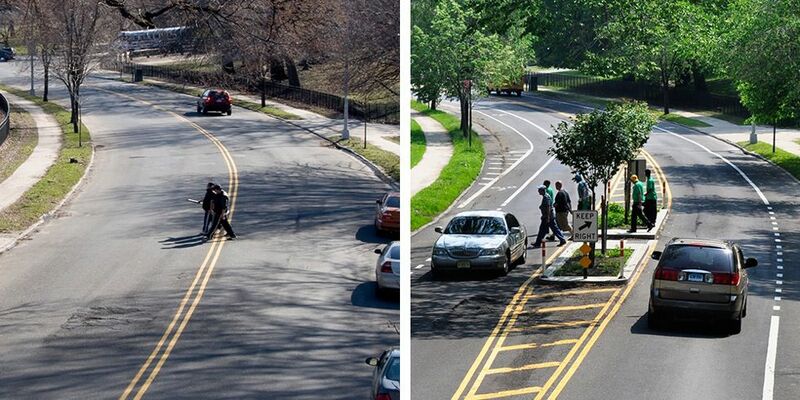 Shared streets should have limited or no markings to reinforce the regulation of the street as a shared space. Branyan, George. 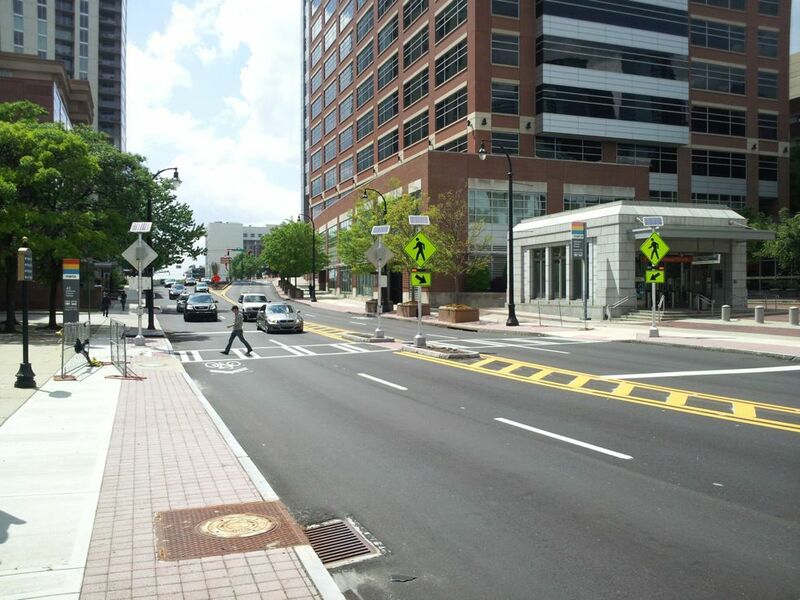 “DC Experience with the HAWK-Hybrid Pedestrian Signal and Rectangular Rapid Flashing Beacons.” DC Department of Transportation. CTC and Associated, LLC. “HAWK Pedestrian Signals: A Survey of National Guidance, State Practice and Related Research.” WisDOT Research and Library Unit, 2010. Federal Highway Administration. 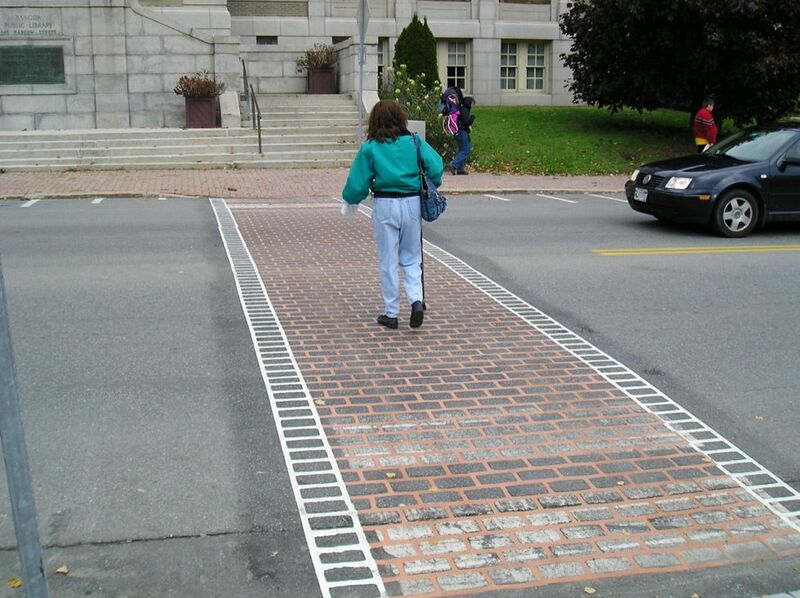 “Lesson 12: Midblock Crossings.” Federal Highway Administration, University Course on Bicycle and Pedestrian Transportation (2006): 1-17. Fitzpatrick, Kay, Brooke Ullman, and Nada Trout. 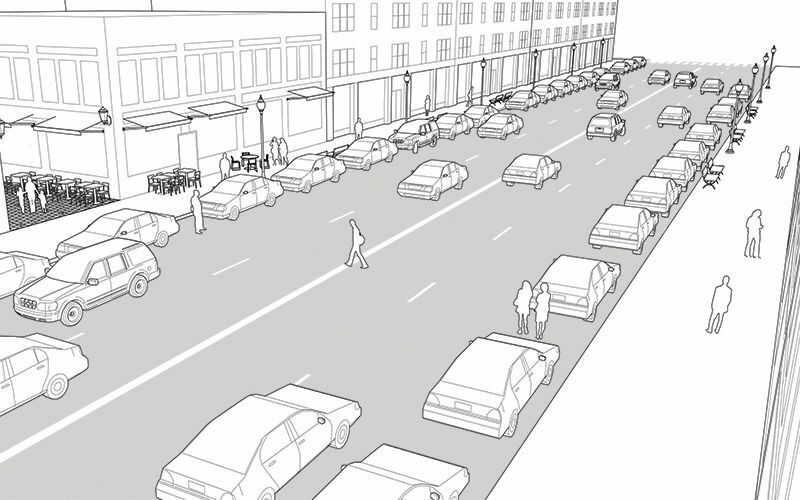 "On-Street Pedestrian Surveys of Pedestrian Crossing Treatments." Prepared for the ITE 2004 Annual Meeting and Exhibit, Washington, D.C., 2004. Fitzpatrick, Kay, Shawn Turner, Marcus Brewer, Paul Carlson, Brooke Ullman, Nada Trout, Eun Sug Park, Jeff Whitacre, Nazir Lalani, and Dominique Lord. 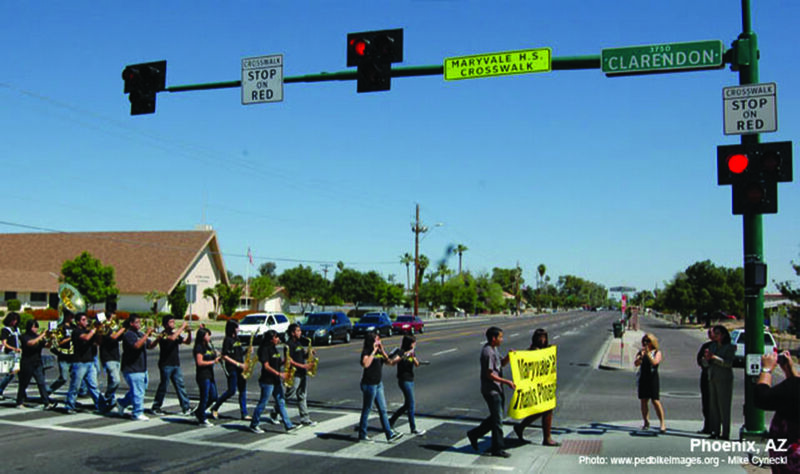 “Improving Pedestrian Safety at Unsignalized Crossings.” Transportation Research Board NCHRP Report 562/TCRP Report 11 (2006): 1-111. Gibbons, Ronald B., Chris Edwards, Brian Williams, and Carl K. Andersen. 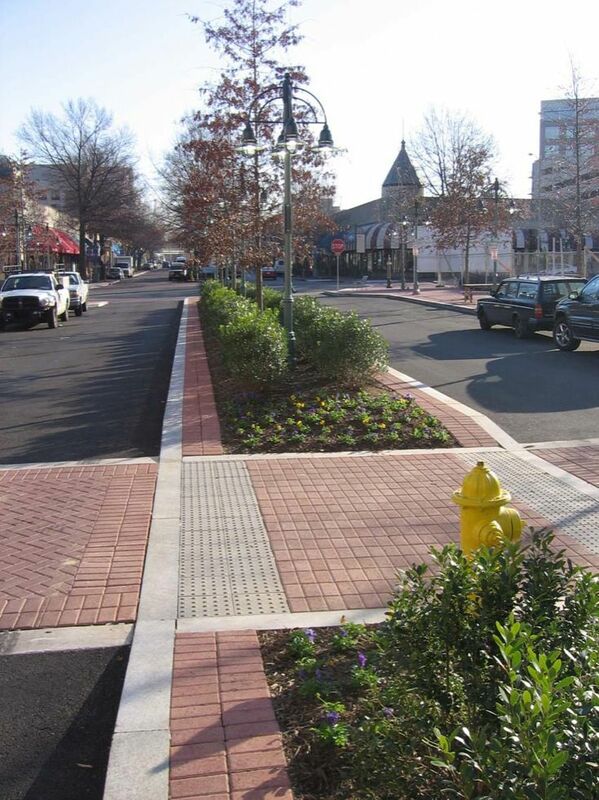 “Informational Report on Lighting Design for Midblock Crosswalks.” Federal Highway Administration Report FHWAHRT08-05 (2008): 1-32. Hunter, William W., Raghavan Srinivasan, and Carol A. Martell. "Evaluation of Rectangular Rapid Flash Beacon at Pinellas Trail Crossing in Saint Petersburg, Florida." Transportation Research Record: Journal of the Transportation Research Board 2314 (2012): (1), 7-13. Lu, George (Xiao-Zhao) and David A. Noyce. "Pedestrian Crossings at Mid-Block Locations: A Fuzzy Logic Solution for Existing Signal Operations." Prepared for the 88th Annual Meeting of the Transportation Research Board, Washington, D.C., January 11-15, 2009. Mitman, Meghan Fehlig, Doug Cooper, Brooke DuBose, and Swati Pande. “Driver/Pedestrian Behavior at Marked and Unmarked Crosswalks in the Tahoe Basin.” California Path Program, Institute of Transportation Studies, University of California, Berkeley, 2010. 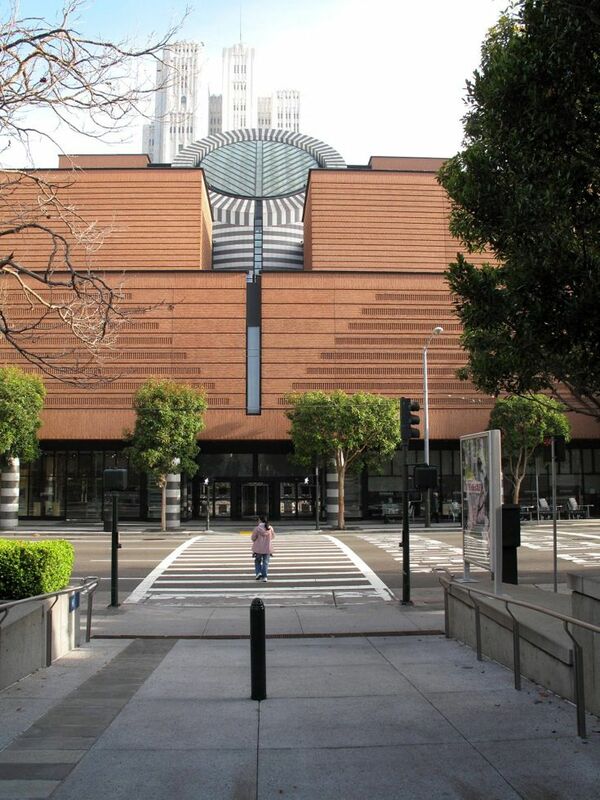 References for Midblock Crosswalks: 8 found.